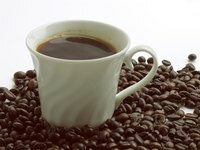 Standard coffee makers are subject to a variety of problems that can affect the taste of the coffee. Dust and other contaminants can build up in the hard-to-reach places of the coffee maker and get in to the coffee. Since coffee makers are also subject to a great deal of moisture, they can be ideal breeding grounds for mold. A mold problem doesn't automatically mean you need a new coffee maker, but it may take some time to eliminate mold depending on the style and build of your individual maker. Remove and clean any parts of the coffee maker that can be removed. On most models this will include the filter tray and any reusable filters. Use a cloth and a dish detergent to scrub the individual parts. Scrub the outside of your coffee maker with the cloth and dish detergent to clean any dust or mold spores that may be there. If you can, scrub the inside of the water reservoir as well, though keep in mind, some models will not have a large enough reservoir to access. Fill the coffee pot half full with water and half full with white vinegar. Put the filter tray back in to the coffee maker. You will not need to put a filter in the filter tray. Pour the water-vinegar mix in to the coffee maker's water reservoir. Set the coffee pot in the maker and set the coffee maker to brew, so that the mixture goes through the coffee maker. Once the coffee maker has finished, let the mixture sit in the coffee pot for ten minutes. Pour the mixture out of the pot. Before you make coffee, run clean water through the coffee pot just like you did with the vinegar-water mixture to rinse it out. You may need to do this two or three times to get the vinegar completely out of your coffee maker. If you don't want to use soap or dish detergent with your coffee maker, you can put vinegar in a spray bottle. Use that to scrub on the outside and inside as well. Use a toothbrush to scrub smaller areas, such as the hinges on the water reservoir lid, or inside of the water reservoir itself. Regular cleaning prevents mold growth and dust build-up that contaminates your coffee.